We believe in contributing to our broader communities, and we believe in making design accessible to everyone. Last week on Martin Luther King Jr. Day, we held our Inaugural Day of Service. In October 2018, we put out a call to the Greater Boston and Massachusetts Community to submit proposals for service projects that required some architectural and planning services. We heard from a number of organizations and ultimately selected four projects from across the state. Later in the fall, one-third of our staff signed up to participate in the Day of Service. The teams met with their clients and defined the scope of work appropriate to the project. On the Day of Service, the teams dedicated the entirety of their workday to their initiative. During the day-long event, stakeholders from the community partners worked with our staff in a collaborative design process tailored to their organization’s mission. At the end of the week, the teams presented their projects to the rest of the firm with their clients in attendance. The Brayton School Corridor Trail is a path on the West End of North Adams that has historically been used for foot traffic to and from Brayton Elementary School and the Northern Berkshire YMCA by residents of the Brayton Housing Complex, a low-income housing complex in the city. This trail, while used by some, is now overgrown after years of lapsed maintenance. 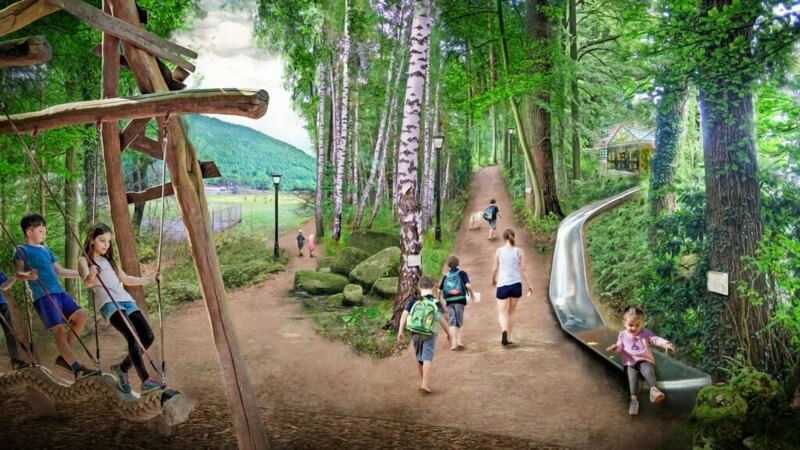 The project team developed a plan to extend the existing path to create a ‘linear park’ that engages students in learning opportunities as they walk to and from school. As they enter Braytonville Park, students will find a playground connected to a winding ramp. Students can either weave through the different spaces along the ramp or take a direct route up a central stair that connects the park to the school entrance. As they pass by various species of trees and plants and play around locally-sourced boulders, students learn about the local flora, fauna and geology through all their senses. This plan aims to make the path both user-friendly and aesthetically pleasing to provide a safe route for students to go to and from school and the YMCA on foot. The Community Day Center (CDC) of Waltham is a 501(c)3 nonprofit organization and has been in operation for 15 years, providing case management services to chronically homeless adults in Waltham. The CDC is housed on the second floor of a building in central Waltham, where they now struggle with issues of over-crowdedness. They recently received an opportunity to occupy the second floor of the adjacent building, which would provide space to alleviate some of the crowding in their existing facility. The added space could also accommodate a broader range of programs in which the CDC could partner with other service organizations and volunteers. The team worked with the CDC to explore uniting their existing and expansion space so that they can continue to welcome their current guests to an increased range of services, as well as bring in other members of the community who would benefit from education and resources related to the widespread issue of substance abuse and addiction. The key to this layout is in the construction of a bridge between the current and adjacent building. Beyond its function in connecting spaces, we see this bridge as an emblem of the bridge CDC endeavors to make for its guests, a bridge between their present circumstances and a better life. In a broader context, we believe the bridge will help CDC to bring together diverse segments of the local community. Currently, there is a shortage of parking for the Franklin Park Zoo and local businesses. Adding additional parking is challenging because of Franklin Park’s historic park status. The challenge is to sensitively design expanded parking in ways that are sensitive to the function and aesthetic of the Park. 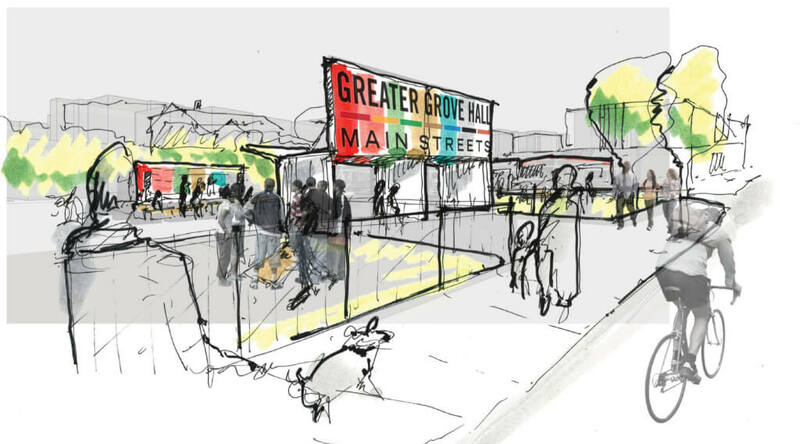 This project team explored concepts for a new gateway that would connect the eastern edge of Franklin Park, the surrounding Grove Hall community and the future extension of Boston’s Emerald Necklace. The gateway would create a new entry point for the park and alter the arrival sequence with the aim of reducing pressure on parking in the area. The team also sought to reinforce wayfinding, safety, and a healthy community. To attain these goals, they made recommendations for the implementation of a new pedestrian walkway with added lighting, signage and painted sidewalks to promote safety and navigability. Also, the team offered solutions to adjust the current bike share infrastructure and relocate existing bus stops to permit increased accessibility and safer conditions for commuters. Lastly, they incorporated a flexible space that can be used for parking on peak days or for community events, such as a farmer’s market. 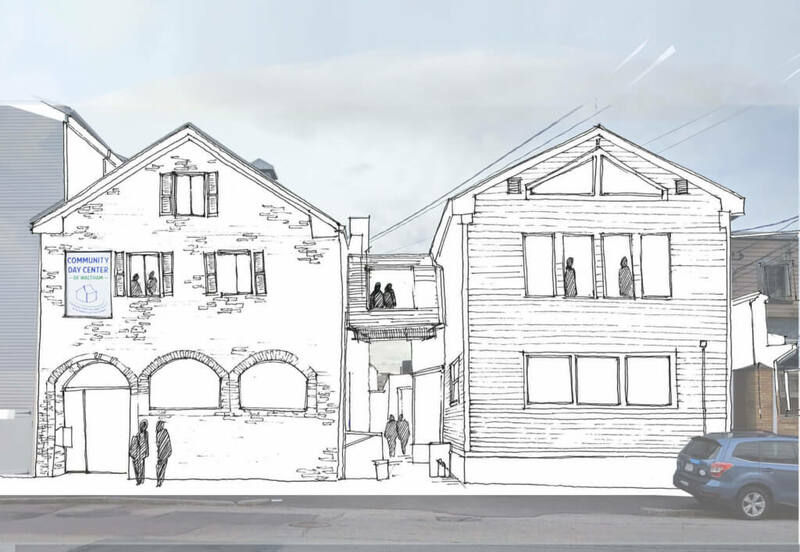 One team worked on the design of an empty lot that could become a pop-up meeting place for food, music and socializing along Blue Hill Avenue in Dorchester, MA. The idea behind the Pop-Up Food Truck pavilion is that residents and commuters could come to this lot on Fridays after work to get food from various food vendors, listen to music and socialize with friends and neighbors. The project team created a plan for a pocket park that could accommodate a variety of Grove Hall’s needs. On the eastern edge of the park, they allotted a space to situate four to six food trucks. Next to the food trucks would be a dining area, complete with tables and chairs made from re-purposed shipping pallets, making for easy assembly. To increase the sense of community and create a space for community events, their design included an 8’x20’ stage area located at the center of the plot, facing the entrance. The stage could be used for small performances such as school bands or other community gatherings. To the west of the stage, the team envisioned a flexible activities area, working as an extension of the performance area and food truck zone. It was great to see our staff join together to solve design challenges in the Greater Boston and Massachusetts Community. We plan to conduct a Day of Service on Martin Luther King Jr. day in the future. For more information and to stay in touch, please email us.